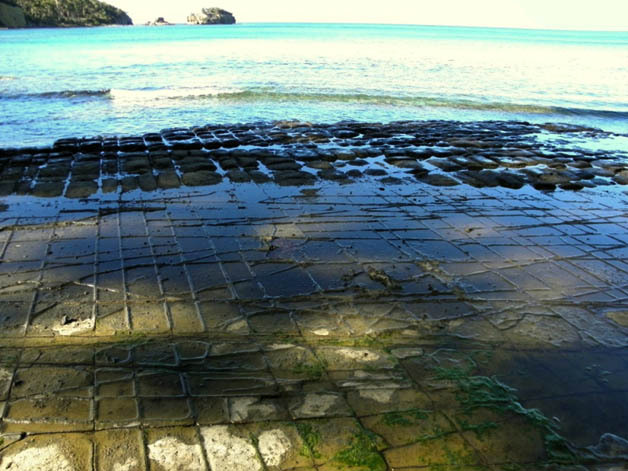 Photo: Arthur Orchard – Tessellated Pavement with Clydes Island in the background. Situated on the tideline below The Lufra Hotel and Apartments car park, this rare geological feature has to be seen to be believed. Formed by cracking of the rock caused by movements in the Earth’s crust, subsequent salt and water erosion have created loaf-like formations near the water’s edge, and concave pan-like “tiles’ further back. An amazing sight at any time but more so when the light is right. It is, truly, a photographer’s paradise.